Nvidia has launched its anticipated 'Tri-SLI' technology as "3-way SLI", allowing gamers to connect not one, not two but three graphics cards in co-operative rendering harmony. They have to be Nvidia GeForce cards, natch, but when connected deliver up to 2.8 times the performance of a single GPU. That, the company claimed, is enough to allow games 60fps frame-rates at a resolution of 2560 x 1600 with 8x anti-aliasing enabled. Or Crysis at 1920 x 1200 with all the DirectX 10 eye-candy turned on. As expected, 3-way SLI works on systems build upon Nvidia's nForce 680 SLI chipset, and requires three GeForce 8800 GTX or 8800 Ultra cards. A special three-card connector links the three add-in boards. 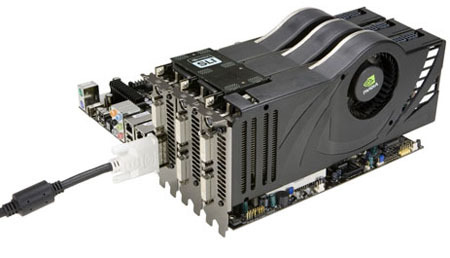 Oh, and you'll need an 1100W power supply with six six-pin PCIe power connectors... phew.